It was a hot, hot day even at 06:00 but then so was the birding – turned out to be a most enjoyable morning’s birding. In the security parking area there were Violet-backed Starlings, overhead Palm Swifts but I was too busy getting the ‘indemnity form’ signed to see much more. Once in the picnic area we picked up Olive Woodpecker (gets a star) – we had a good turnout with some new members and visitors. Lucky for me Steve Davis had joined us and agreed to lead the one group – thanks Steve! On the walk down to the very bottom hide we stopped off at the first bird hide – Little Grebe, plenty of Yellow and Village Weavers, and Red Bishops. Later on we were to get Thick-billed and Spectacled Weavers. The water birds were rather sparse, Yellow-billed Duck, Common Moorhen, a brief glimpse of a Reed Cormorant, Black Crake, Darter and of course Egyptian Geese and a solitary Spurwing Goose. 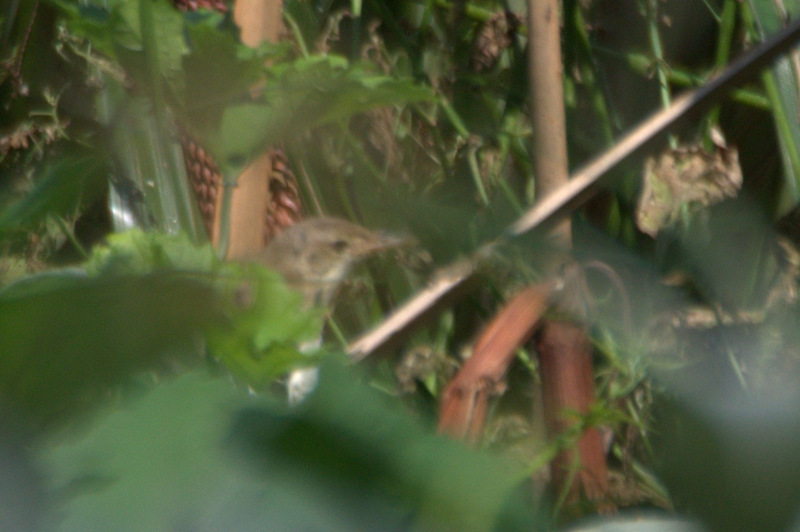 Our warbler count was much better; Willow, Little Rush, Lesser Swamp, African Reed and best of all Great Reed (gets a star)! 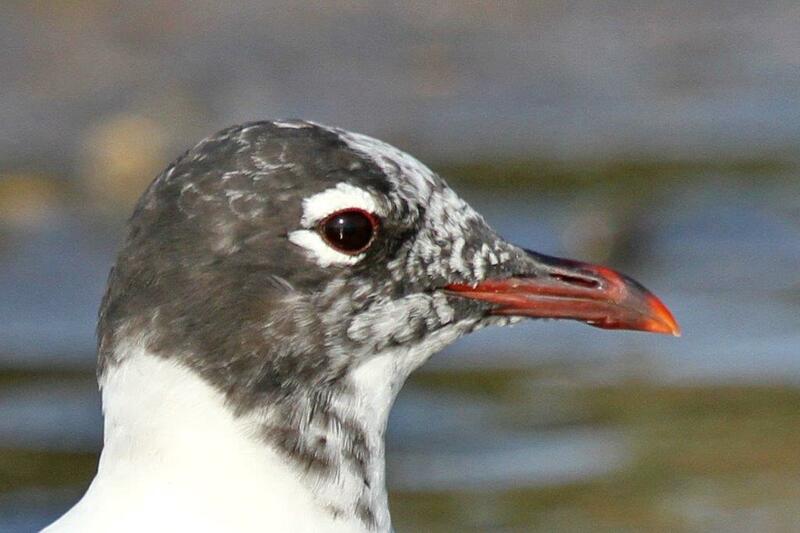 (John’s photo of the head and long bill helped with the ID back at the picnic site but it had also been heard calling). To begin with a lot of birds were IDed on call but later seen. Brown-hooded Kingfisher, Diderik’s, Klaas’s and Red-chested Cuckoos, Black-headed Oriole, Red-capped Robin-Chat, Burchell’s Coucal, Tambourine and Red-eyed Doves, Purple-crested Turaco, Terrestrial Brownbul, Dark-capped Bulbul, Sombre and Yellow-bellied Greenbul, Sunbirds – Amethyst, Collared, Olive and Purple-banded. The Yellow-rumped Tinkerbirds called incessantly and perched obligingly for photoshoots! Green-backed Cameroptera, Red-faced and Rattling Cisticolas, Black, Dusky and Paradise- Flycatchers, Speckled Mousebirds, Bronze and Red-backed Mannikins, Little Bee-eater, Fan-tailed Widowbirds, Black-collared, Crested and plenty of White-eared Barbets, Tawny-flanked Prinia, Black-backed Puffback, African Hoopoe, African Fish-Eagle, Yellow-billed Kites, Black Saw-wing, Barn, Lesser Striped and White-throated Swallows and plenty more. Tamsin and Jane who arrived early picked up an African Openbill (gets a star!). My group saw a raptor – there were two schools of thought!! John managed to get a shot and back at the picnic site Steve and Jenny both agreed it had to be a Honey Buzzard (another star). Our count at tea was 99 – we were not allowed to count the blue Budgie (could have been another star). Then two Woolly-necks flew over – 100!! 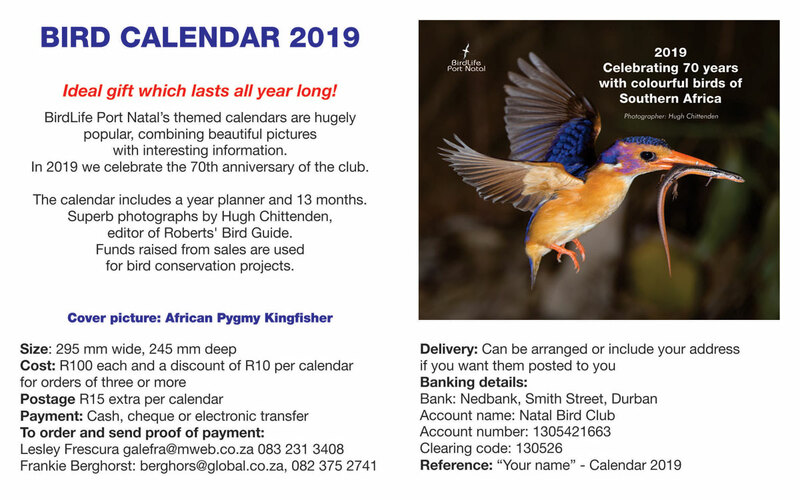 But a little later an African Firefinch was heard calling from the very top of a gumtree (not the usual place for an African Firefinch but a definite ID was made) – so now our count was 101 but as they say in the classics “don’t count your buzzards before they hatch”. Steve’s group who called Common Buzzard were wrong! 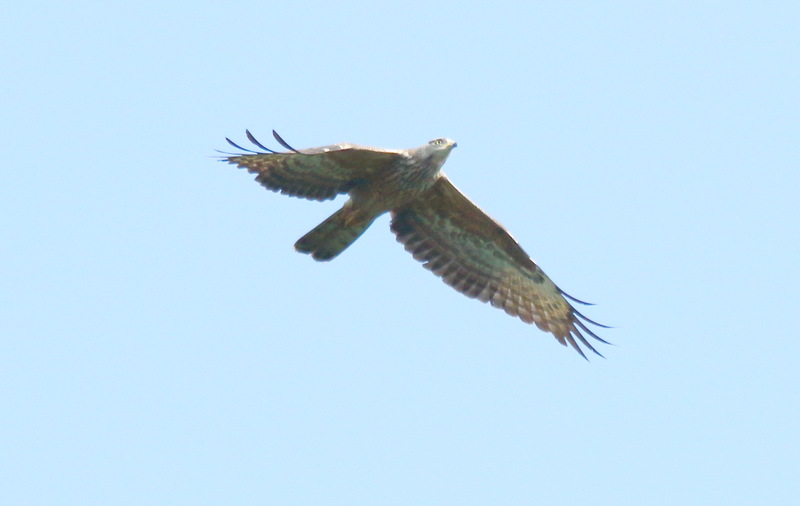 When Steve checked his photos back at home it turned out to be a Honey Buzzard (great photo). So our final count was 100 – not too shabby!! Thanks to John, Steve and Mick for photos. This entry was posted in Activities, Home, Posts, Reports and tagged Elena Russell, Umbogavango. Bookmark the permalink. As always Elena, beautifully written and a great outing. Congratulations.